Stopping stuttering can be essential to those with that speech disorder. By identifying possible causes of stuttering, 10 tested methods are listed to support. A stutter or stammer is a speech disorder which involves disruptions and stoppages that interrupt the timing and smooth flow of speech. They may be repeating words, syllables, or sounds, such as in "da-da-daddy". In other cases, they will be prolonged sounds that stretch out words, like "mmmmmummy". At other times, there may be silent blocking of a person's airflow during speech, leading to no sound. This may make speech sound jerky, tenseor forced. No matter the form stammering takes, it is possible to find out how to stop stuttering. Experts are still investigating what causes a person to develop a persistent stutter. They think there is a combination of causes. Here is a chart that lists some of the most common causes of stuttering. Stammering can be inherited among families and it may be due to genetic abnormalities within the brain's language centers. 60% people who stutter are reported to have a family member with stuttering disorder. There may be abnormalities in the areas of speech motor control, like motor, sensory, and timing coordination. At times, stuttering is due to brain injuries like trauma or stroke. Children are more likely to outgrow their stuttering if they begin stammering before age 3 ½. There is a higher chance that your children's stuttering will persist if it continues for over 6 months. Boys are more likely than girls to stutter by three or four times. Those with other language deficits or speech problems tend to have stuttering. In rare cases, stuttering may occur because of emotional trauma. Perhaps one of the most common ways to stop stuttering is to see a speech or language therapist, particularly those who specializes in stammering. You can seek some advice from your doctor and contact one on your own. Therapy may be conducted individually or in a group. For some people with a stutter, the stammer is less obvious when they are talking in an area with multiple conversations or singing along to someone. An echo earpiece reproduces this effect by sending an echo of the patient's voice, which can then unblock the issue. This may not be the solution for all people, but it can help some who have such an issue. When it comes to how to stop stuttering, electronic devices can help. There are a few types of electronic devices that can help reduce a stutter. One relies on delayed auditory feedback that makes you talk slower. If you don't, the sound is distorted through the device. Another option will mimic your speech, making it sound like someone else is talking in unison with you, similar to the echo device. Some of the electronic devices are small enough to be worn all day. This method helps you slow down so you can notice when you stammer. This therapy typically begins with talking slowly and deliberately, and gradually you will obtain better fluency. Eventually you will work up to talking with a normal speech pattern. 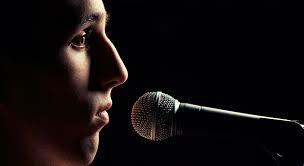 Also, adding rhythm to your speech can give you better results, which seems more like singing. In some cases, stuttering is due to stress within the body, particularly tightness around the throat areas. As such, relaxation exercises regarding on the neck and shoulders can reduce tension in particular areas like your throat and neck and make it easier to speak. Try to let tension out between blocks. Instead of saying something like "blah" between blocks, try letting out a deep and guttural noise, like "grrrr." Although it may seem odd at first, talking to yourself in front of a mirror can actually help reduce your stutter. You can talk about anything you want. The point is that by watching yourself successfully talking, you will build the confidence and realize you can do it without stammering. As mentioned earlier, some people with a stutter notice their problem disappears while singing. This is because singing uses a relatively even breathing pattern, helping to enunciate more clearly, and involves uttering sounds naturally in longer and drawn-out sentences when compared to standard speaking. While singing works in some situations, it won't always be an option in a professional setting. Pick any book you want and start reading it out loud. It will be a challenge at first and may be frustrating, but over time it will become clear why this is one of the ways of how to stop stuttering. It will help you breathe correctly and let you learn how to recover from stuttering while talking. Try to visualize the words. When you imagine the words, it lets you claim the words, making them easier to say. If you have issues with a particular word, try using a synonym. You can also try spelling out a word and pronouncing it letter by letter. Don't avoid pausing; silence is just not that frightening. Say the vowels: Take the time to clearly and loudly pronounce each of the vowels. Make sure to distort your face and be overly articulate. Make use of your tongue: Open your mouth so your jaws are as far apart as possible without too much exertion. Hold this position and elevate the tip of the tongue to touch your mouth's roof. Keep your tongue on the roof and drag its tip to the back of the mouth. When it is stretched all the way, hold it; then pull it outside your mouth, stretching it down toward your chin with holding several seconds. Repeat this process for 4 to 5 times. Breathe deeply: Deep breathing can strengthen your respiratory organs while relaxing neuromuscular tension. Try to use breathing to create a pattern among your words and try different deep breathing exercises. Read quickly: In addition to simply reading aloud, try reading aloud as fast as you can without worrying about how you sound. Ignore misspoken sounds and keep going. Try to talk to your child slowly and calmly. Keep a calm and quiet home environment. Focus on what your child says instead of how. Don't make suggestions like slowing down. Try not to interrupt your child. Don't call attention to the stutter. Spend one-on-one time with your kid daily. As for fluency, you can try these tips that may help with your speech. Take your time while talking. Don't think negatively or expect the worst. Talk about it; don't hide it.